Best place to stay in Gran Canaria in december, january, february, Easter or August... for every needs. Where to stay in gran canaria for nightlife. Best area to stay in gran canaria for couples. Best location in Gran Canaria where to stay. 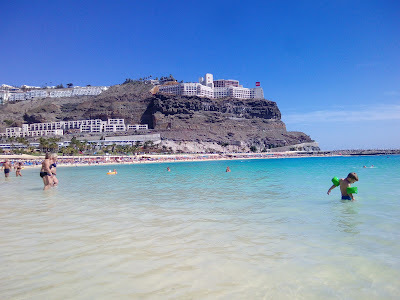 If you are wondering if the Canary islands are the right choice for you, what to see, where to go, the best area to stay in Gran Canaria, best beaches, best hotel… Today I will write an article to help you to choose the best places to take a holiday in Gran Canaria. If you do not know the island, this article will be very useful, I'll give you some advice to avoid unpleasant surprises and avoid compromising your holiday. Leggi l'articolo in italiano. Clicca qui. The Canary Islands are in the Atlantic Ocean off the coast of southern Morocco. The climate is warm and dry because of the proximity to the Sahara Desert. Depending on how the trade winds are blowing, there may be more or less wind. The closest island to the European continent is Lanzarote while the farthest is Tenerife (considering only the main 4 islands). Calculate this if you hate sitting “like a sardine” for over four hours, by taking a “No frills” airplane company. No doubt: Playa del Ingles or the capital city: Las Palmas. Best beaches for sunbathers and swimming in all seasons: the best beaches are between Puerto Rico and Puerto de Mogan. The most beautiful and popular beaches in this area are Playa de Amadores and Anfi Del Mar. Playa de Amadores, Puerto Rico and Anfi del Mar beaches are perfect if you have small children because the sea slopes gently and, even if the ocean water is colder than the Mediterranean Sea, in winter you can swim or walk on the beach without the problem of the waves or the hassle of the strong wind. To know: The beaches in Spain are always free. If you want, you can rent a sunbed and umbrella at reasonable price (about 3 euro each). ⇨ HOTEL PLAYA DEL INGLES (BEVERLY PARK). Excellent value for money. Possibility of half board or all inclusive. One of the most booked hotel in Playa del Ingles. Very close to the equipped beach. ⇨ APARTHOTEL PLAYA DEL INGLES (VERIL PLAYA). Choose this location if you want to stay close to the Dune and the wide beach. If you are looking for a tourist place with some centers dedicated to nightlife. ⇨ PLAYA INGLES ECONOMIC APARTMENTS: Apartamentos Amazonas. For those seeking an independent and economical solution near the beach. ⇨ APARTHOTEL IN PUERTO RICO: Rio Piedras. Good value for money. Ideal for winter stays, for family with children, for sea life in every season of the year. ⇨ ADULTS ONLY APARTMENTS: Only for adults guests (no children) in Puerto Rico. another area designated for classic sea life. Between Amadores and Anfi mar. ⇨ HOLIDAY VILLAGE At Mogán Playa: Beautiful resort located in the hottest and no windy part of the island: Puerto de Mogan. Small but pretty beach surrounded by shops. A village made up of white houses with colorful flowers on the balconies. Intimate, full of restaurants, ideal for couples or for families with children. ⇨ Car Hire at Las Palmas Airport: Search and compare deals on economy cars and more. Best beaches for water sports: If you are an athlete, or want to try something different, you should go to the Puerto Rico Beach. Here you will find different centers offering various activities such: Parascending, Jet-ski, Jet Boat "El Diablo", Jetovator, Banana Boat. Best beaches for windsurfers, kitesurfing: For those who love surfing, the beaches dedicated to this sport are in the: POZO IZQUIERDO or VARGAS places that are notoriously windy. In Gran Canaria there are also schools and courses to learn how to practice these activities. If your Vacation is between June and September it is fine also stay in Maspalomas, Playa del Ingles, Meloneras or Las Palmas but for the other months I highly recommend moving to the southwest countries because they are less windy. Maspalomas worth a visit to see the famous sand dunes, but the beach is “open” and not protected from the wind so at least in winter I would not recommend it. The wind moves the sand that creates an annoying “mist”, it can irritate the eyes. 2- Formula Aparthotel: the pleasure of staying in a furnished apartment and eating in the hotel's main restaurant. Terrazza De Amadores apartamentos: breathtaking views of Amadores Beach. 3- Apartment self-catering: It is a solution very popular in the Canaries, in high demand by northern Europeans. It is usually an apartment located in a tourist complex furnished with bed linen, bath towels, water and electricity included. 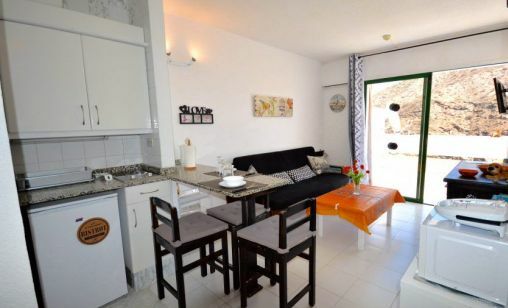 A kitchenette equipped with pans and crockery and a private bathroom with shower or bath. The meals are at your expense. For those wishing to spend less may want to consider this alternative. It depends on the season but there are apartments available for 2 or 3 people from 265 € a week and more expensive during the pick season (Christmas, New Year, till Easter ...). There are many restaurants that offer tourist menus affordable. If you are intersted in this solution, cast a glance if there is availability in my apartment for rent in Puerto Rico. Gran Canaria is an island with large temperature differences between the countries of North and South and between those inland and coastal countries. In the southwest of the island the temperature reach 30 degrees, even in winter. In the north the temperature can drop to 15-18 degrees with wind and rain. That's not the ideal climate to sea life and carve out a break in the sun in winter. 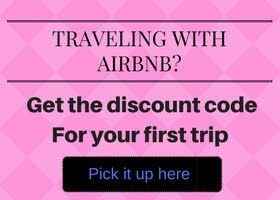 Think about it before booking an accommodation. It is interesting to see all that the island offers in its diversity, but if you want to make a holiday “sun and beach” in Gran Canaria, the best areas where to stay are in the south, even better in the countries of the southwest that are more protected from the wind. 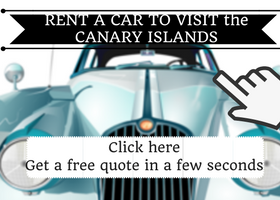 To visit the island, I suggest to book a car directly online (to get cheap prices) and pick up the car at the airport. I always rent a car for my holidays in Gran Canaria. 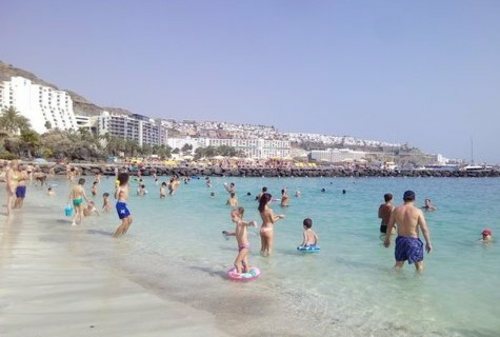 To make a holiday in Gran Canaria is important to know what do you prefer. How to make a great holiday in Gran Canaria? Accommodation : Considering another factor "Near the city center or the sea?" I’m Italian so... I know the culture of my countrymen. Do you know the first question Italians ask me about the apartment? "But ... Is the apartment close to the sea?" "Close to the sea" for an Italian means that the sea is a few centimeters from the front door, 500 meters from the sea is already outskirts. For example, my Norwegians guests prefer stay away from the chaos of the city center and love walking. There is no better or worse but it is important to be informed and choose according to your needs. The area of ​​Playa del Ingles and Maspalomas is flat, suitable for those with mobility problems or does not like to walk far to get to the beach. To know: Pay attention if you stay in Maspalomas in the "Campo international". Here you usually have to take a bus to reach the sea because access to the beach is not direct but you need to go to Playa del Ingles. In this area the apartments are small bungalows or duplex scattered in various tourist complexes. A Playa del Ingles there are mainly apartments. In front of the sea there are usually luxury hotels, very beautiful but also quite expensive. Anfi del Mar is an exclusive and luxurious area and there are predominantly Hotels. The apartments are quite expensive. ​​Amadores or Puerto Rico are hilly towns, so you must consider of going up and down the steep streets and stairways. All these seaside resorts are very crowded in winter by foreigners, usually retired people. At the weekends and in the summer months, you'll find a local tourism: the inhabitants of the north of the island, or inland, that make a trip to the south. If you go to the beach on weekends you'll notice the difference and the huge influx of people. TIP: Playa del Ingles and Maspalomas better in the summer months, the other places in the South are less windy and are good in all seasons. If the article is useful to you, let me know by putting a "like" ^ _ ^ or sharing it in your favourite social network. Thanks and enjoy your stay. - Best area to stay in Tenerife for nightlife. - Best place to stay in Lanzarote. - Least windy part of Fuerteventura. - Warmest canary Island in december. - Canary Island or balearics? Which is the Best for you. - Car Hire at Las Palmas Airport: Search and compare deals on economy cars and more.